Variable speed AC drives have become very popular because of their energy efficiency. Additionally, they offer flexible control of processes and machinery using maintenance-free AC motors. AC drives use power switching techniques and generate high rates of change of voltage. Most modern AC drives use voltage-source PWM inverters. They use fast-switching power semiconductor devices such as Insulated Gate Bipolar Transistors (IGBT). These are now the industry standard because of their reliability and low switching losses. However, the drives’ fast-changing voltage causes some increase in the voltage stress on the motor winding insulation. Generally, this extra stress is well within its capability. Yet, there have been reports of motor winding insulation failures, thought to be due to using a PWM drive. Most of the failures reported have been in systems using AC supply voltages in the region of 525 V to 575 V used in the Americas. There is little evidence of such effects occurring with standard European LV supplies. The number of failures reported is small, but enough to cause concern in some application areas. This may become more relevant as with the use of higher voltages for some applications in Europe. As a result, some users and consultants may be specifying countermeasures that are costly and are often unnecessary. A technical guide from leading UK Trade Association Gambica outlines the effects involved, and how to mitigate them. It also addresses other potential cabling issues including long cable runs, and cable capacitance. When there is a long cable run between the VSD and motor, voltage peaks may damage the motor windings. It is due to a combination of fast switching transistors and long motor cables causing peak voltages up to twice the DC link voltage. The definition of long motor cables depends on the drive rating and type and may vary between 250 m for lower power drives and 500 m for higher power ratings. Refer to manufacturers technical documentation. In extreme cases, this high peak voltage can cause premature ageing of motor winding insulation which leads to motor failure. 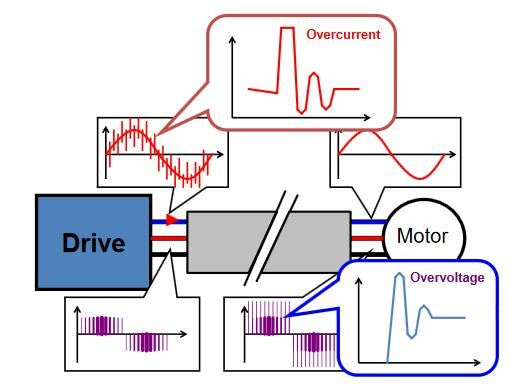 To ensure that motor life time is not compromised, the simplest action is mounting the drive and motor close together. Other options include using motors to IEC60035-25B, or adopting shorter cabling distances. To avoaid problems use unshielded cables or lower the VSD switching frequency to 2.5 kHz. As well as the peak voltage, consideration of the instantaneous peak current is also required. At each inverter output pulse, the distributed cable capacitance charges and discharges. For small motors with long cables, the cable charging currents may be of the same order as the motor rated current! Cable charging currents may cause nuisance inverter overcurrent tripping. For each inverter frame size, there is a maximum cable length for both shielded (braided or armoured) or unshielded cables. These and may vary from 10 m on very small drives to above 250 m on high power drives. Measures such as reactors, transformers or filters will help extend the maximum cable length. Using the correct motor, or adopting preventative measures avoids damage and extends motor life. For further reading see Gambica Technical Guide ‘Motor Insulation Voltage Stresses Under PWM Inverters Operation’. The guide provides information on the basic operating principles of PWM inverters. It makes emphasis on the type using IGBT switching devices and the interface with the motor. Further, it deals with transmission line effects in the supply cables between the inverter and the motor. Finally, it gives advice on the ability of motors to withstand inverter supplies, and when controls are necessary.